When it comes to being an SIUE Cougar, the Jambgas have made it a family business. Gwinyai Jambga, BA ’93, and Stephanie (Montgomery) Jambga, BS ’91, are proud to be SIUE alumni. Gwinyai served as a vital member of the SIUE men’s soccer team in the early ‘90s, and Stephanie played a pivotal role in SIUE softball’s success of the late ‘80s. Upon college graduation, the Jambgas married and lived in Edwardsville for a few years before returning to Gwinyai’s native country of Zimbabwe in 2000. By 2013, the entire family was involved with the Harare International School. Children Devyn, Hadyn and Bailey were either students or graduates; Gwinyai was athletic director; and Stephanie was an elementary teacher and coached several sports. The children had great success at the Harare International School, both academically and athletically, before continuing their education at SIUE, where Devyn and Hadyn are following in the footsteps of their father as members of the SIUE men’s soccer team. Gwinyai and Stephanie are proud that their children chose to attend the school that brought them together. Gwinyai and Stephanie currently live in Paraguay, but thanks to modern technology, the parents have never missed a soccer match since their eldest son joined the team, often waking up as early as 2 a.m. to view each game’s live stream. “Being enrolled at the same university my parents once attended is surreal, and having my brothers here makes it so much easier to be this far away from home,” said Bailey. Recently, the entire family reunited for the SIUE Homecoming 2016 festivities. Gwinyai and Stephanie beam with pride as they see three children thrive in athletics and academics in the school they once attended. 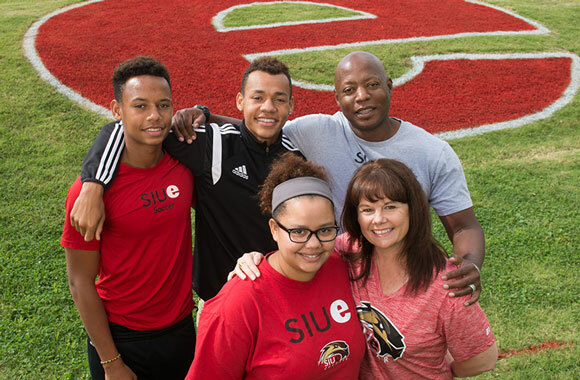 Read more about the Jambga family and their time at SIUE.